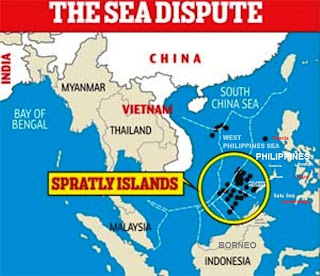 China's naval intrusion to the Philippine territory since Saturday April 7, 2012 in the Scarborough Shoal / or also called Panatag Shoal is a follow-up to its recent forays into Philippine western territorial waters. It is the fifth times where China Intruded the Philippine Territory since June 2011. 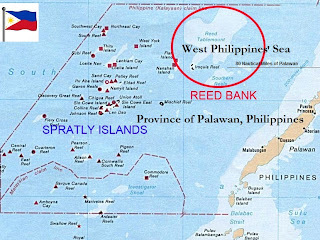 The recent is the Panatag Shoal / Scarborough Shoal. 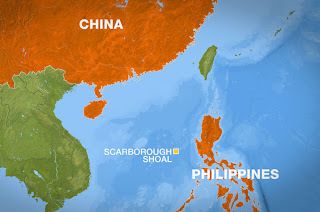 All four lie a few dozen kilometers off Palawan but 2,000 km from China's nearest island-province of Hainan; Scarborough is 220 km off Zambales but more than 800 km from Hong Kong. China's pretext of protecting its fishermen and seismic surveyors is not unique. 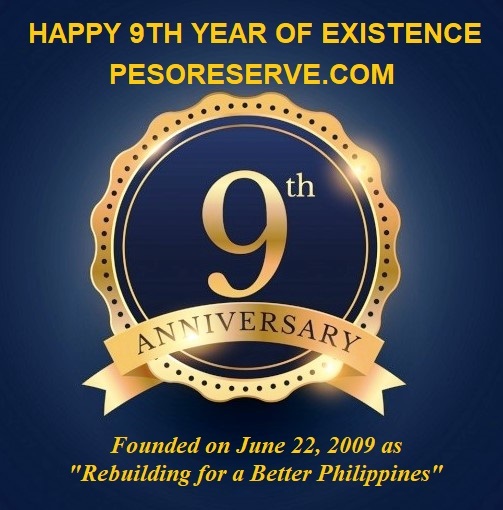 As in the last two decades, it trespasses into Philippine offshore oilfields and abets fish poaching to prop up a shaky counterclaim over the West Philippine (South China) Sea. China's flouting of international and Philippine fisheries laws triggered the Scarborough standoff. Eight Chinese craft were spotted Sunday hauling in endangered shark, giant clams, and corals in the 150-sq-km lagoon called Baja Masinloc, long a rest stop of Luzon fishermen. As the Philippine naval patrol BRP Gregorio del Pilar approached, two Chinese marine surveillance ships cut its path to shield the poachers. Beijing was quick to accuse Manila of harassing Chinese fishers who supposedly had only sought shelter from a storm. The Philippine response was mainly diplomatic. President Noynoy Aquino and Foreign Sec. Albert del Rosario quickly but firmly reminded the Chinese ambassador of the two countries' pact to shun violence in the troubled seas. The Navy has pulled out to let its Coast Guard civilian counterpart handle things as a police matter. A military skirmish would be futile. Though the Navy's fastest vessel, the del Pilar is a refurbished five-decade-old US coast guard cutter. The handful of other Philippine warships and planes are newer but lightly armed. On the other hand, China seems to treat tact as its debility. Both sides are signatories to the UN Convention on the Law of the Sea, which defines coastal and archipelagic countries' 200-mile exclusive economic zones. 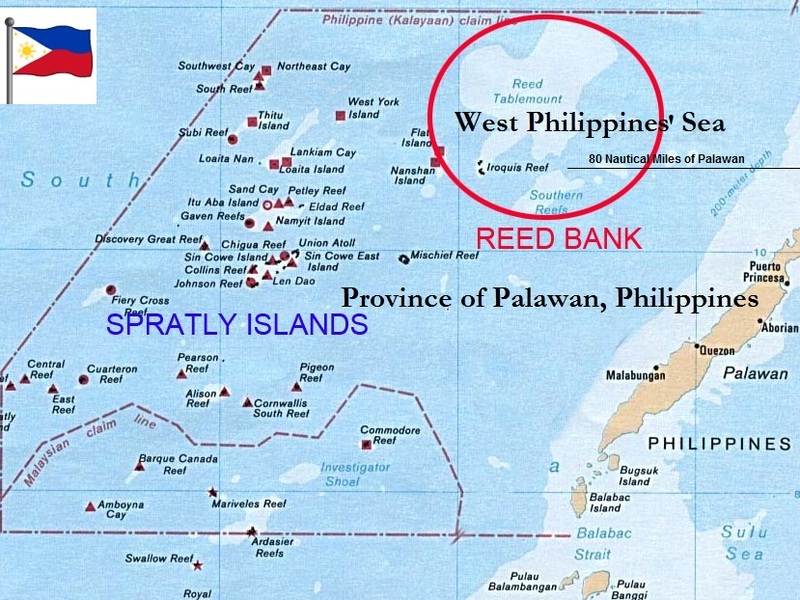 China's counterclaim to the long-recognized western Philippine shoals, reefs, atolls, and banks is based solely on unverified "ancient maps." In contrast to Manila's stance, China is itching to play the military card. Its naval buildup has been worrying not only the Philippines but other ASEAN members as well, and Japan, South Korea, India, Australia, and America. China's annual defense spending has risen from $30 billion in 2000 to $120 billion in 2010, says the SIPRI (Stockholm International Peace Research Institute). Since Beijing habitually deflates by half its true naval and arms acquisitions, reports The Economist, the true budget for 2012 including research and development could well run up to $160 billion. It's still less than a fourth of America's (declining) defense buys, so Chinese leaders make a show of shuddering at comments of aspiring to become a military "near peer." 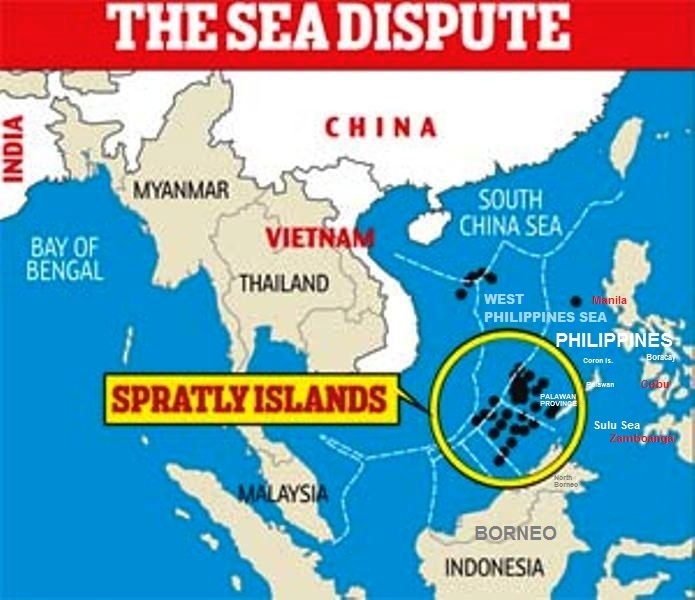 But while invoking China's "peaceful rise," they employ war footing with Vietnam, South Korea, and Japan— and the Philippines — when it comes to territorial counterclaims in the North, East and South China Seas. Having 75 principal surface warships and some 50 diesel electric submarines emboldens China. Defense magazine's latest issue enumerated the arsenal of China's People's Liberation Army-Navy: 26 destroyers, 53 frigates, 26 tank-landing vessels, 49 attack submarines, and five nuclear submarines. Not counting the fighting craft from five civilian agencies (coast guard, maritime surveillance, fisheries enforcement, etc.) the PLAN also has 86 coastal patrol craft. All are armed with anti-ship medium-range cruise missiles. China's avoidance of diplomacy also has to do with its hazy chain of command. While its government funds most of its operations, supplies and personnel, the People's Liberation Army does not report to the defense ministry. Its orders come instead from the Communist Party's Military Commission, headed by the Party chairman, also the President. By contrast, the foreign office is low in the Politburo totem pole. Perhaps it proceeds from Mao Zedong's tenets. "Political power grows out of the barrel of the gun," the founder of communist China had pounded. "Without the Army, the Party is nothing." Neighbors doubt China's assurances that, like them, it wants peaceful resolution of its encroachments. Beijing's bigwigs talk from both sides of the mouth. The Party's English-language paper, Global Times, betrays the doublespeak. As the defense minister mentioned "peace" 26 times in a speech before East Asian leaders last October, it editorialized: "If these countries don't want to change their ways with China, they will need to prepare for the sounds of cannons. 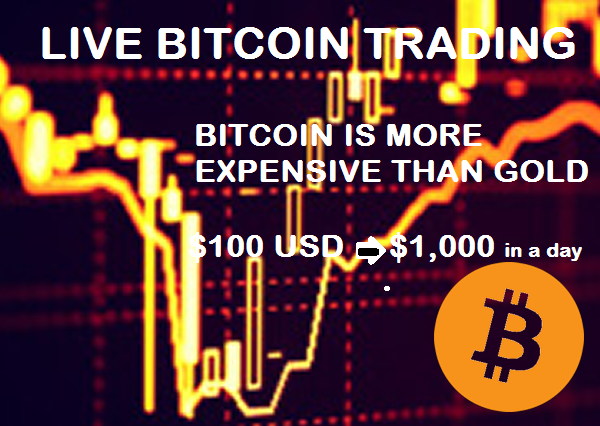 We need to be ready for that, as it may be the only way for the disputes in the sea to be resolved." Beijing may disavow the communist hawks' opinions as unofficial. But there can be no doubt about the official line, as stated by the PLA's doctrinal "Science of Military Strategy," published in 2005. The Economist quotes it: "Although active defense is the essential feature of China's military strategy, if an enemy offends our national interests it means that the enemy has already fired the first shot. In which case, the PLA's mission is to do all we can to dominate the enemy by striking first." In the news is not only the Philippine territorial row with China, but also ex-President Gloria Arroyo's arraignment for the NBN-ZTE scam. To better understand these and other events, readers may wish to read Exposés: Investigative Reporting for Clean Government. This selective compilation of my Gotcha columns also features, among others, the Diwalwal-ZTE scam, the near cession of territory to Moro separatists, and the NAIA-3 construction anomalies. Early copies available at National Bookstore and Powerbooks.